David L. Chandler of the Massachusetts Institute of Technology (MIT) News Office reports that an MIT research team headed by Jeffrey Grossman has found a way to make sheets that push “towards the ultimate power conversion from a material” for solar power. His team has managed to fabricate molecule-thick photovoltaic sheets which could pack hundreds of times more power per weight than conventional solar cells. 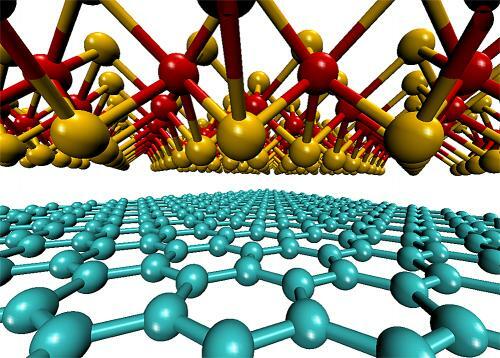 Stacking sheets of graphene and materials such as molybdenum disulfide would make solar cells with one to two percent efficiency in converting sunlight to electricity. That seems disappointingly low compared to the 15 to 20 percent efficiency of commercially available silicon solar cells. One nanometer thick, this material is thousands of times thinner and lighter than tissue paper, though, and stacking multiple layers of the tissue-like films would create significant increases in energy collection efficiency. Postdoctoral candidate Marco Bernardi was lead author on the team’s paper and thinks, “Stacking a few layers could allow for higher efficiency, one that competes with other well-established solar cell technologies.” Maurizia Palummo, a senior researcher at the University of Rome visiting MIT through the MISTI Italy program, was also a co-author. Bernardi says that pound for pound, the thin cells could produce up to 1,000 times more power than conventional cells. Their billionth of a meter thickness is about “20 to 50 times thinner than the thinnest solar cell that can be made today. You couldn’t make a solar cell any thinner,” according to Grossman. Because so little material is needed to make such thin stuff, and the costs of materials are far lower than those for silicon cells, these should be low-budget offerings compared to today’s solar panels. Because the material is relatively stable, it can be used in open-air applications with no need for glass covers such as silicon panels require. Grossman reflected on the theoretical nature of the work so far, leaving many avenues open to explore. “There’s a whole zoo of these materials that can be explored. My hope is that this work sets the stage for people to think about these materials in a new way.” Molybdenum disulfide and molybdenum diselenide are the two-dimensional materials studied so far, but the “zoo” is open. The team can only speculate at this point on the many other materials available, and the innumerable combinations that could increase efficiency. As the team moves beyond computer modeling to actually producing working samples of these materials and discovering ways in which they could be produced at a commodity level, the potential for transforming energy collection and applying these breakthroughs to transportation will also transform what our future aircraft will look like and how they will perform.